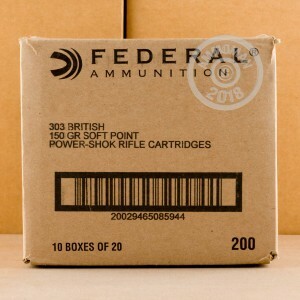 This .303 British ammunition from Federal's Power-Shok series is an inexpensive yet highly effective hunting load for your Enfield or other .303 rifle. 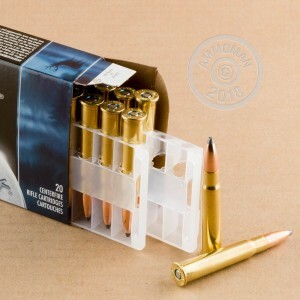 Manufactured in Anoka, Minnesota, these cartridges fire a 150 grain soft point bullet at 2,460 feet per second and deliver excellent expansion without fragmentation. The Lee-Enfield is the dominant .303 British rifle available and a highly respected taker of medium and large game. It's also affordable thanks to the large number of rifles produced for British and Commonwealth forces during the first half of the 20th century. 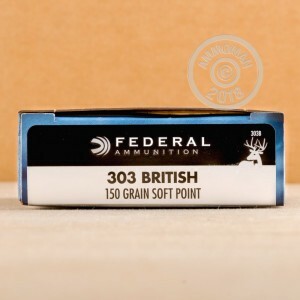 .303 British is a little easier to find in Canada than it is in the US, but fortunately we've got it here at AmmoMan.com! Place an order for $99 or more and we'll even throw in free shipping.